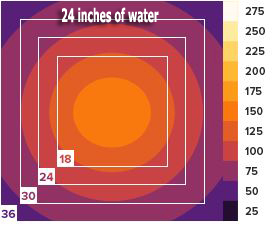 The TMC AquaRay AquaBeam & GroBeam LED is "among the best of the best". 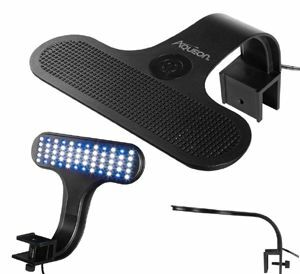 Aqueon Freshwater Aquarium LED Clip-On Light for up to 20 gallon. 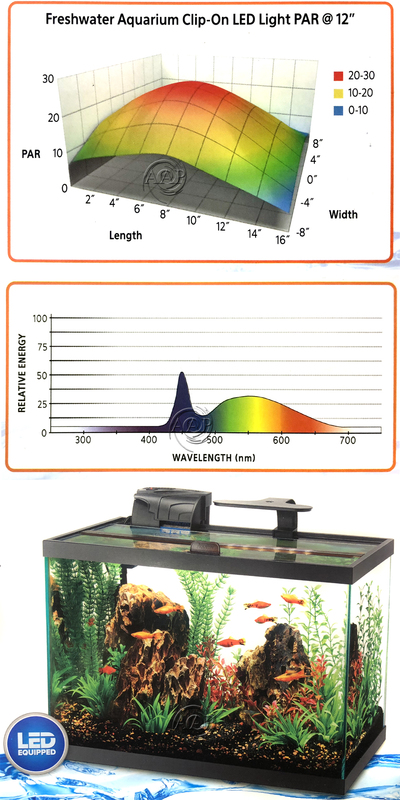 Convenient and affordable options to add LED lighting in any aquarium. 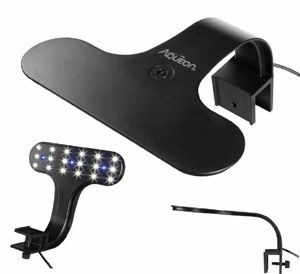 These elegant super thin Clip-On LED lights hover over aquarium providing optimal lighting for a bright thriving environment. Soft-touch switch LED, easily mounts on framed or frameless aquariums using versatile mounting screw. 21 Bright LED's for shimmering illumination, ideal for freshwater aquariums up to 20 gallons. Easily mounts on framed or frameless or trimmed frame aquariums using versatile mounting screw. Aqueon Planted Aquarium LED Clip-On Light for up to 20 gallon (for larger aquariums, multiples can be used). Soft-touch switch LED, easily mounts on framed or frameless aquariums using versatile mounting screw. 60 Bright LED's for shimmering illumination, ideal for freshwater aquariums up to 20 gallons. Our recommended LED for those desiring economy but not wanting to pay for the marketing hype nor "bells & whistles" of the Finnex, Fluval or similar Economy LED lights. 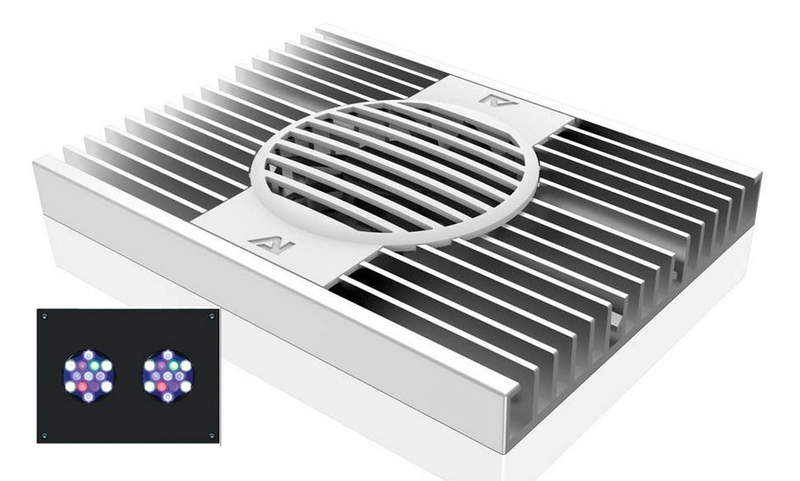 In the end, you will get JUST AS CAPABLE of a planted aquarium light with this "AAP/Aqueon Planted LED" as with the before mentioned other economy brands at a lower price. If you seek the best, as per efficiency, longevity, & best PAR/PUR output, there is no other choice than the AAP AquaRay. This is our premier LED light for reef or high tech planted aquarium keepers looking for the highest amount of light energy per square inch/centimeter! While the AquaRay line is still our recommendation for most applications, especially those seeking the highest PUR per input wattage of energy and the over all efficiency (& guaranteed fixture longevity), the AI Hydra HD LEDs provide a light for this specific niche of high tech aquarium keepers. There's no need to buy an additional controller just to be able to use your light properly, the Hydra HD Series has control built-in. Use your iOS, Android or wireless internet-connected device to control the Hydra HD, anywhere in the world! Please note that since the Hydra HD uses its own router to initially connect/set-up, if using a computer, it must be wireless capable. 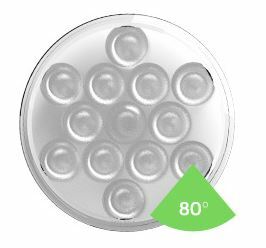 You can also use an acclimation setting to set a time period for lower light levels, allowing your photosynthetic life to adjust to your new light. Freshwater or Saltwater by adjusting emitters! 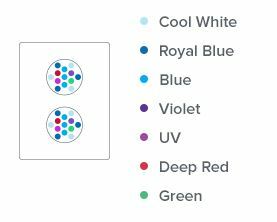 Please note as per our "Aquarium Lighting" article, when tuning/adjusting these emitters to specific needs, you will be not running the light fixture at full capacity and 40% (or more) of the light potential PAR output will be lost! 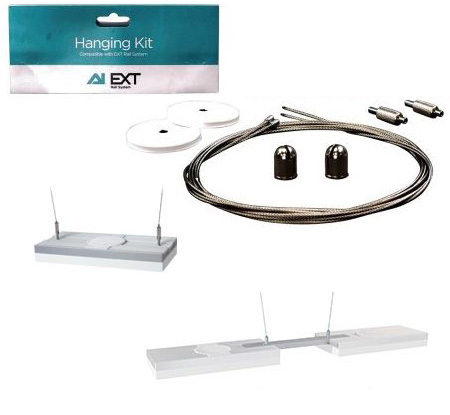 The EXT Hanging Kit allows you to hang one, or many, lights above your tank. With the included 96 inch cables, the EXT Hanging Kit easily adjusts to any height. Just link them with any length EXT Rail to hang more than one AI LED at once or for more options (sold separately). Flexible, Waterproof, & Self-Adhesive LED lighting strips. High output red to low infrared LEDs. 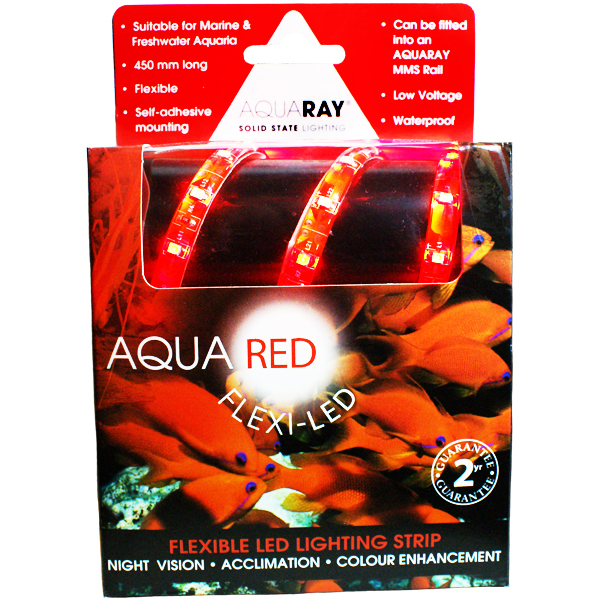 The red strips are excellent for use with nocturnal fish such as Blennies. 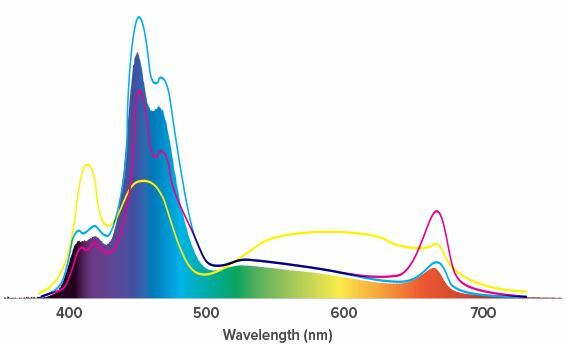 Many nocturnal fish are active with low level red lighting present in their aquarium. The blue strips are excellent for use as a moon light for those who prefer a blue color for night lighting. 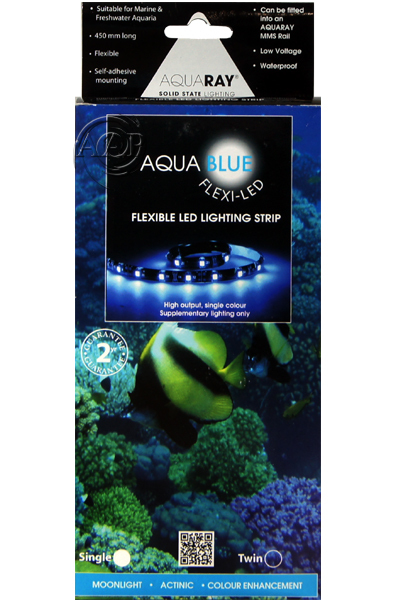 An aquarium keeper can place these Flexi Blue LEDs on a household time to go on when the main aquarium lights go off. 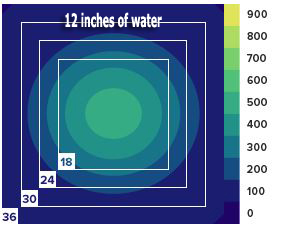 An example would be a 100 gallon freshwater aquarium with two AquaRay Colour Plus 1500 tiles and two Flexi Blue Strips, each run with simple timers or with the Colour Plus on a more advanced TMC Controller while the Flexi LED is run on a basic timer. Total power consumption = 3 watts per strip. All within the 400-700 PAR values. Supplementary lighting, but these still count toward overall light output. 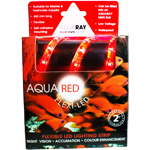 Works with both the TMC AquaBar LED or Flex Red/Blue LED Strips. Operates one "bar" or strip per dimmer. Utilizes analog 0-10V "current reduction" dial. See composite picture below of the dimmer. For our full Shipping & Return Policy Pages (International Shipping, Checkout Info. Express, etc.) or to "Contact Us" Click the buttons above. *Please use the Shopping Cart below to purchase products via Credit Card or PayPal.